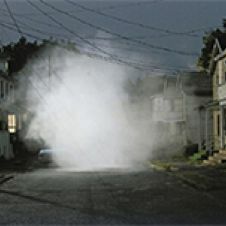 The photographer Gregory Crewdson was born in 1962 in Brooklyn, New York. 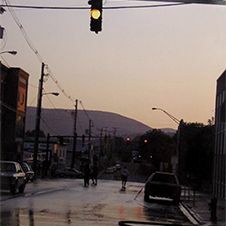 As a teenager he was part of a punk-rock band called The Speedies and according to legend it was their song („Let me take your photo“) that inspired him to become a professional photographer. 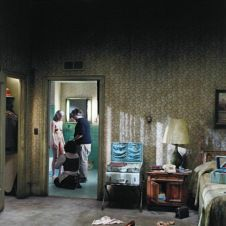 Crewdson stages his photographs with incredible efforts similar to how movies are produced. 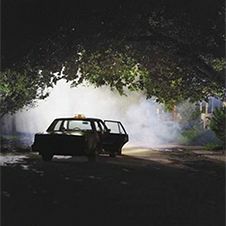 His posed photographs are reminiscent of scenes from American films by David Lynch or Alfred Hitchcock. 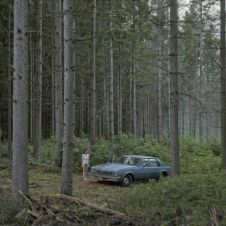 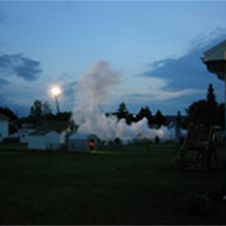 In some of his production stills such as Forest Gathering #3 from 2003 the artist documents his work and creates mystical photographic artworks.